Wisdom teeth are well known for causing trouble, often between the ages of 18-25 which is when they tend to emerge into the mouth, although they can become troublesome at any age. Sometimes wisdom teeth will cause discomfort for a short while and then settle comfortably into position. However, when there isn’t enough room for wisdom teeth to fit into the available space, or they are so far back that effective cleaning is impossible, it may be necessary to have them removed. Please call us to arrange a consultation with one of our dentists. They will take a look to see why your wisdom teeth are uncomfortable, how much room is available and will generally be able to provide you with relief from any discomfort you are currently experiencing. To assess the position of the wisdom teeth, they will provide you with a referral to have a full-mouth x-ray taken by one of the radiology practices in Canberra or district. It is generally possible to make an appointment for this type of x-ray within a few days of calling the radiology practice. 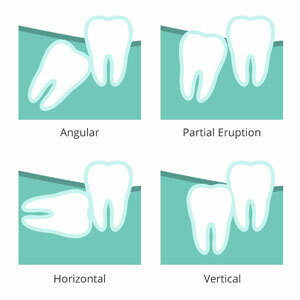 If one or more of your wisdom teeth need to be removed, your dentist will discuss your options for having this done. If the teeth are positioned awkwardly in the jaw or have long or very curved roots we will generally refer you to an oral surgeon for treatment. If you would prefer to have your teeth removed whilst under sedation or asleep (general anaesthetic) we will refer you to the appropriate practitioner. Our dentists like to screen teens and young adults for the presence of un-erupted wisdom teeth: if the teeth are unlikely to emerge into the mouth easily it is often recommended to have the teeth removed well before they begin causing trouble. We welcome questions about wisdom teeth, so please contact us on (02) 6293 1356 if we can be of any assistance.